Clingman's Brigade, consisting of the 8th, 31st, 51st, 61st North Carolina Infantry Regiments, was commanded by former US Senator Thomas Lanier Clingman, a fire-eater of North Carolina. A persuasive orator, Clingman was able to rally men from rural areas to urban centers for the war effort. Typical of most politicians of the conflict, Clingman was often found leading his men on the battlefield and directly into shot and canister while discharging their weapons only to press the brigade with cold steel into the trenches and works of the enemy. The brigade had one of its bloodiest fights during the Battle of Cold Harbor, and at Fort Wagner it had also engaged the 54th Massachusetts (Colored) Volunteers, an all volunteer black unit led by white officers. The 54th had heroically charged the works at Battery Wagner, Charleston, with some of its men breaching the parapet only to be raked by Confederate artillery and small arms. The all black regiment was made rather famous with the Oscar winning movie Glory. The US senator was initially colonel of the 25th North Carolina, a unit that was also pushed into public domain with the movie Cold Mountain. Perhaps more than any other figure during the great Civil War, Clingman was mentor to the only white man to have ever served as Cherokee chief, and his leadership factored in Chief Thomas aligning the Eastern Cherokee Nation with the Confederacy. A prominent soul in the evolution of the Old North State, Clingman has been memorialized with Clingman's Dome, a majestic mountain in western North Carolina. (About) Brig. 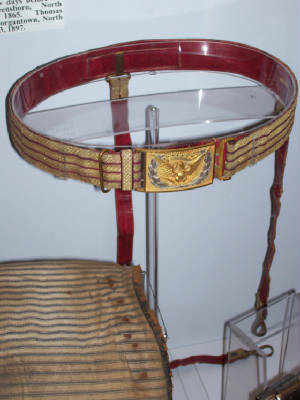 Gen. Thomas Clingman's Civil War Sword Belt and LeFaucheux Revolver. Photos Courtesy Texas Civil War Museum and by the writer. During the American Civil War, Thomas Lanier Clingman commanded an all North Carolina infantry brigade consisting of the 8th, 31st, 51st and 61st North Carolina Infantry. Clingman's Brigade fought at Goldsboro, Battery Wagner (aka Fort Wagner), Drewry's Bluff, Cold Harbor, Petersburg, Globe Tavern, Fort Fisher and Bentonville. The famous 54th Massachusetts Volunteer Infantry Regiment, brought into public spotlight by the movie Glory, was led by Colonel Robert Gould Shaw in a determined yet failed assault on Fort Wagner. During the charge it had engaged Clingman's regiments. On June 1, 1864, "A tall and uncommonly fine looking officer in the front rank of the enemy's column, looking me directly in the face, took off his cap and cheered his men with words I could not catch." General Clingman referring to Colonel Elisha S. Kellogg of the 2nd Connecticut Heavy Artillery during the Battle of Cold Harbor, Virginia. Kellogg had been about ten paces directly in front of Clingman. And within moments of exclaiming those words, Kellogg received two bullets to the head and immediately fell dead. Clingman had initially commanded the 25th North Carolina and afterwards the brigade of his namesake. General Robert E. Lee's confidence and esteem for Clingman was known by many in the Army of Northern Virginia, and he would even request Clingman to defend Richmond, the city that hosted the Confederate capitol. Later, Clingman and his "Bonnie Blue Boys" assisted in routing Union forces at the Battle of Cold Harbor, a fight that would cause General Ulysses S. Grant, a West Point graduate and veteran of the Mexican-American War, to say that "I regret this assault more than any one I ever ordered." Grant would ride his fame into the White House as the Eighteenth President of the United States. 8th Infantry Regiment State Troops completed its organization at Camp Macon, near Warrenton, North Carolina, in September 1861. Its members were from the counties of Pasquotank, Perquimans, Camden, Currituck, Edgecombe, New Hanover, Franklin, Granville, Cumberland, Chatham, Harnett, Warren, Rowan, Greene, and Alamance. Sent to the coast, it was captured in the Battle of Roanoke Island. After being exchanged, it was assigned to General Clingman's Brigade and then transferred to General Hoke's Brigade. And it was subsequently assigned to Clingman's Brigade. The 8th fought at Goldsboro, relocated to Wilmington, and on February 16, 1863, was ordered to Charleston, South Carolina. At Charleston it took an active part in various conflicts, including the fight at Battery Wagner. It also participated in the engagements at Plymouth, Drewry's Bluff, and Cold Harbor, and endured the long Petersburg siege south and north of the James River. During December 1864, the unit was ordered to North Carolina and in March 1865 saw action at Bentonville. It had 568 officers and men at Roanoke Island, sustained 9 casualties at Goldsboro, and during the Charleston siege had 4 killed and 43 wounded of the 393 engaged. The regiment lost 26 killed and 101 wounded at Plymouth, and eighty-five percent of the 175 in action at Fort Harrison were disabled. On April 26, 1865, the unit surrendered. The field officers were Colonels Henry M. Shaw and James M. Witson; Lieutenant Colonels Rufus A. Barrier, James W. Hinton, John R. Murchison, William J. Price, and George Williamson; and Majors Henry McRae, Andrew J. Rogers, and Edward C. Yellowley. 31st Infantry Regiment organized at Wilmington, North Carolina, in September 1861. It contained men from Anson, Edgecombe, Brunswick, Beaufort, Craven, and Harnett counties. While stationed at Roanoke Island, the unit was captured in February 1862. After being exchanged, it was assigned to General Clingman's Brigade and remained under his command for the duration of the war. The 31st fought at White Hall, then moved to the Charleston area where it was engaged in various conflicts including the fight at Battery Wagner. Ordered north, it took an active part in the battles at Drewry's Bluff and Cold Harbor, and later endured the hardships of the Petersburg siege north and south of the James River. In 1865 it fought its last battle at Bentonville. The unit had 456 effectives at Roanoke Island and lost 7 killed, 31 wounded, and 1 missing defending Battery Wagner on July 18, 1863. Few surrendered with the Army of Tennessee. Its commanders were Colonel John V. Jordan; Lieutenant Colonels Daniel G. Fowle, Charles W. Knight, and Edward R. Liles; and Majors John A. D. McKay and Jesse J. Yeates. 51st Infantry Regiment was organized at Wilmington, North Carolina, in April 1862. The men were recruited in the counties of Cumberland, Sampson, Duplin, Columbus, Robeson, and New Hanover. It was assigned to General Clingman's Brigade and served with him for the duration of the War. After fighting at Goldsboro, it moved to the Charleston area and was prominent in the defense of Battery Wagner. The 51st was then ordered to Virginia, participated in the battles at Drewry's Bluff and Cold Harbor, and endured the hardships of the Petersburg siege south and north of the James River. Returning to North Carolina, it saw action at Bentonville. On July 18, 1863, this regiment lost 16 killed and 52 wounded at Battery Wagner and in August contained 374 effectives. In May 1864 it contained 1,100 men and in October there were 145 present. The 51st lost 160 in killed and wounded at Drewry's Bluff, 194 at Cold Harbor, and 104 at Fort Harrison. Very few surrendered with the Army of Tennessee. The field officers were Colonels John L. Cantwell and Hector McKethan, Lieutenant Colonels William A. Allen and Caleb B. Hobson, and Major James R. McDonald. 61st Infantry Regiment was organized at Wilmington, North Carolina, in August 1862. Men of this unit were recruited in the counties of Sampson, New Hanover, Beaufort, Craven, Chatham, Lenoir, Wilson, Martin, Ashe, Alleghany, and Jones. Assigned to General Clingman's Brigade, it marched to the Kinston area and saw its first action. 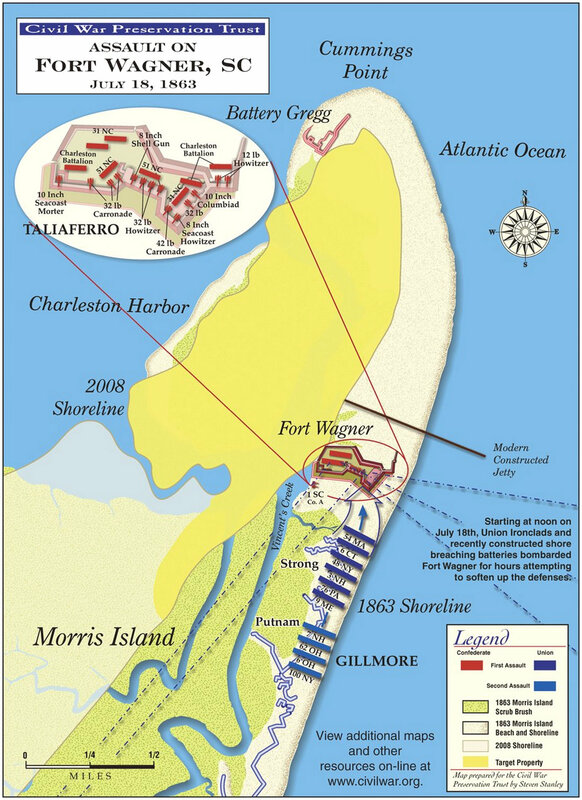 The unit was then sent to Charleston, served on James, Morris, and Sullivan's Islands, and took an active part in the fight at Battery Wagner. The regiment was ordered to Virginia and fought at Drewy's Bluff and Cold Harbor, and then endured the hardships of the Siege of Petersburg south and north of the James River. 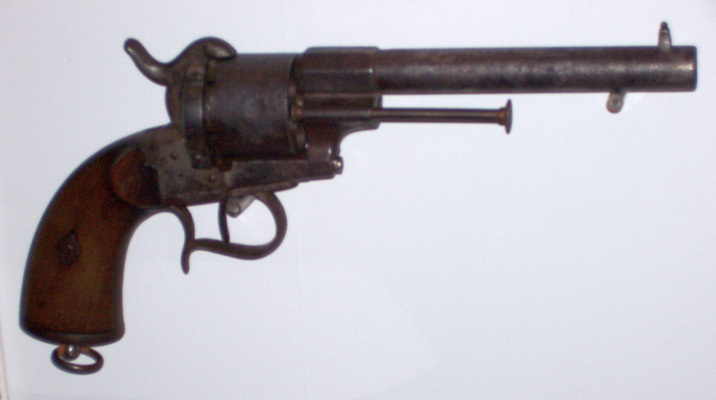 It returned to North Carolina and was prominent in the Battle of Bentonville. While in the Charleston area--July 10 to September 6, 1863--the regiment lost 6 killed, 35 wounded, and 76 missing and in September totaled 331 men. Few surrendered with the Army of Tennessee in April 1865. The field officers were Colonels William S. Davane and James D. Radcliffe, Lieutenant Colonel Edward Mallett, and Major Henry Harding. 25th Infantry Regiment, formerly the 15th Volunteers, was assembled at Camp Patton, Asheville, North Carolina, in August 1861. The following counties furnished companies for the regiment: Henderson, Jackson, Haywood, Cherokee, Transylvania, Clay, Macon, and Buncombe. It moved to Grahamville, South Carolina, and remained there until March 1862. The unit returned to North Carolina and then arrived in Virginia on June 24. Serving in R. Ransom's and M. W. Ranson's Brigade, it fought with the army from the Seven Days Battles to Fredericksburg, served in North Carolina, and then saw action at Plymouth and Drewry's Bluff. The 25th participated in the long Siege of Petersburg south of the James River and the Appomattox Campaign. It reported 128 casualties during the Seven Days Battles, 15 in the Maryland Campaign, 88 at Fredericksburg, and 103 at Plymouth. Many were disabled at Sailor's Creek (also Sailor's Creek), and on April 9, 1865, only 8 officers and 69 were present. The field officers were Colonels Thomas L. Clingman and Henry M. Rutledge; Lieutenant Colonels S. C. Bryson, St. Clair Dearing, and Matthew N. Love; and Majors John W. Francis, William S. Grady, and William Y. Morgan. 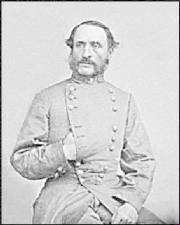 Colonel Thomas Clingman was later promoted to Brigadier-General and commanded Clingman's Brigade. See also Company G "Highland Guards" Flag, 25th North Carolina Infantry Regiment, including Memoirs of Second Lieutenant Garland S. Ferguson, Company F, 25th N.C. Infantry. The real Private W. P. Inman, portrayed by Jude Law In the movie Cold Mountain, was a member of the 25th N.C. Infantry. See also W. P. Inman's Original Records: National Archives. About the Author: Retired research assistant from the Bowman Gray School of Medicine in Winston-Salem, Frances H. Casstevens, is also the author of Out of the Mouth of Hell: Civil War Prisons and Escapes, Tales from the North And the South, and The Civil War and Yadkin County, North Carolina (1997, Winner, 1998 Willie Parker Peace Award—North Carolina Society of Historians). She is a lifelong resident of Yadkin County. Recommended Reading: Confederate Military History Of North Carolina: North Carolina In The Civil War, 1861-1865. Description: The author, Prof. D. H. Hill, Jr., was the son of Lieutenant General Daniel Harvey Hill (North Carolina produced only two lieutenant generals and it was the second highest rank in the army) and his mother was the sister to General “Stonewall” Jackson’s wife. In Confederate Military History Of North Carolina, Hill discusses North Carolina’s massive task of preparing and mobilizing for the conflict; the many regiments and battalions recruited from the Old North State; as well as the state's numerous contributions during the war. Continued below. During Hill's Tar Heel State study, the reader begins with interesting and thought-provoking statistical data regarding the 125,000 "Old North State" soldiers that fought during the course of the war and the 40,000 that perished. Hill advances with the Tar Heels to the first battle at Bethel, through numerous bloody campaigns and battles--including North Carolina’s contributions at the "High Watermark" at Gettysburg--and concludes with Lee's surrender at Appomattox. Recommended Reading: The Civil War in North Carolina. Description: Numerous battles and skirmishes were fought in North Carolina during the Civil War, and the campaigns and battles themselves were crucial in the grand strategy of the conflict and involved some of the most famous generals of the war. John Barrett presents the complete story of military engagements across the state, including the classical pitched battle of Bentonville--involving Generals Joe Johnston and William Sherman--the siege of Fort Fisher, the amphibious campaigns on the coast, and cavalry sweeps such as General George Stoneman's Raid. Described here are the types of men found in any outfit; their not very uniform uniforms; crowded tents and makeshift shelters; difficulties in keeping clean, warm, and dry; their pleasure in a cup of coffee; food rations, dominated by salt pork and the versatile cracker or hardtack; their brave pastimes in the face of death; punishments for various offenses; treatment in sick bay; firearms and signals and modes of transportation. Comprehensive and anecdotal, Hardtack and Coffee is striking for the pulse of life that runs through it. No effort has been spared to include rare war era photographs and color photos of rare artifacts. Engagingly written by William C. Davis, the author of more than thirty books on the American Civil War. Award winning author and historian James M. McPherson states: "The most readable, authoritative, and beautifully designed illustrated history of the American Civil War." Sources: Official Records of the Union and Confederate Armies; Walter Clark, Histories of the Several Regiments and Battalions from North Carolina in the Great War 1861-1865; National Park Service: American Civil War; National Park Service: Soldiers and Sailors System; Weymouth T. Jordan and Louis H. Manarin, North Carolina Troops, 1861-1865; and D. H. Hill, Confederate Military History Of North Carolina: North Carolina In The Civil War, 1861-1865; Photos are Courtesy Texas Civil War Museum (Fort Worth); Civil War Preservation Trust (civilwar.org).